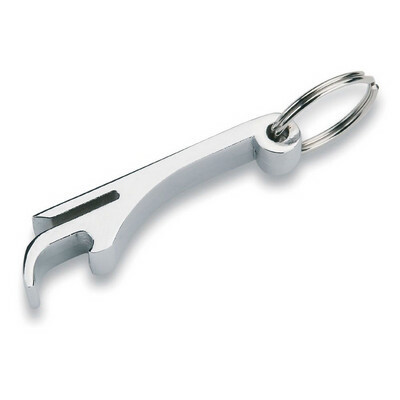 Description: Handy bottle opener fits perfectly onto your keyring. Made from metal/nickel silver finish. Features: Dual function with bottle and can opening features Packaging: Polybag Colour: Silver. Material: Metal / nickel silver finish Product Size: 65mm(h) x 12mm(w) Freight details : 500 per carton, 15kgs, 28 x 17 x 39cms; Decoration Type(s): Colour Print / Laser Engrave / Print with Dome Decoration Area: Laser: 38mm(w) x 9mm(h). Price includes : 1 Colour 1 Position Print. Setup is included.